Our mouth-watering authentic, traditional ice ciders are a true ice cider, we press frozen apples in the winter months and cryo-extract the juice. We then freeze this juice for production of our ice ciders year round. These ice ciders are refrigerated items and should be served cold. Available in our winery shop at $5.99 per bottle, and wholesale to distributors. Absolute 0 Haskap Ice Cider - Iced Haskap and Apple Cider blend 375ml 0.0% alc. 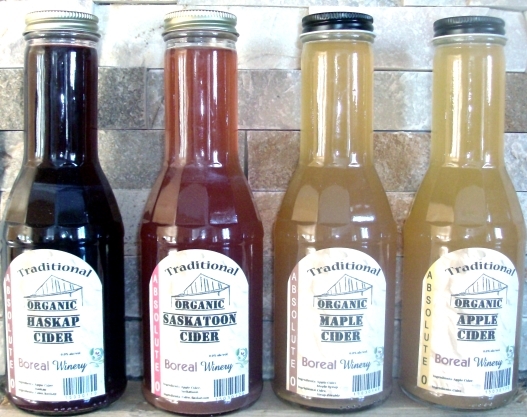 Absolute 0 Saskatoon Ice Cider - Iced Saskatoon and Apple Cider Blend 375ml 0.0% alc. Absolute 0 Maple Ice Cider - local Maple Syrup blended with our Ice Apple Cider 375ml 0.0% alc. Absolute 0 Iced Apple - a blend of delicious frost extracted cider Apples 375ml 0.0% alc. Absolute 0 Iced Pumpkin - Giant pumpkins frost extracted with cider Apples 375ml 0.0% alc. Absolute 0 Iced Cherry - flavorful Wild Cherries and frost extracted cider Apples 375ml 0.0% alc.